FL-PK-15 on 9/2/2014: "Heard the frogs calling in the middle of the night and hoped it meant it was raining or about to. Nope. Bone dry gauge again." FL-AL-4 on 9/5/2014: "Not sure how accurate the measurement is, as a squirrel shredded a mushroom on the top of the post and pieces of it clogged the opening of the funnel." FL-PB-12 on 9/15/2014: "Noticed a large migration of nighthawks this past week." FL-DV-63 on 9/30/2014 reported 1.56": "And a dead bug." FL-CB-10 on 9/2/2014 :"I have seen plenty of lightning shows but last night was the best and most intense I have ever seen in my 73 years rotating around the sun!" FL-MD-49 on 9/17/2014 :"Another dry day in sunny South Florida!" FL-ES-16 on 9/25/2014 :"Beautiful Fall weather, a friend said to me today. I responded, "Yes it 'tis, happens every year that I can remember...."
... And spoke too soon. 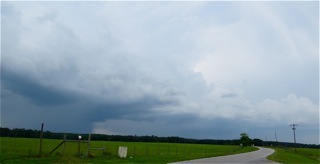 FL-HB-5 on 9/15/2014: "Seems like the rainy season is over here in NW Hillsborough. 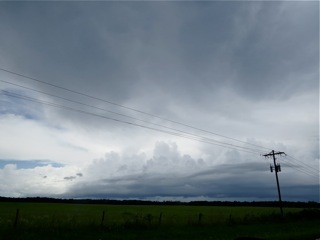 Rain seems to die out and fall apart as it approaches. Very un-September rainfall here." 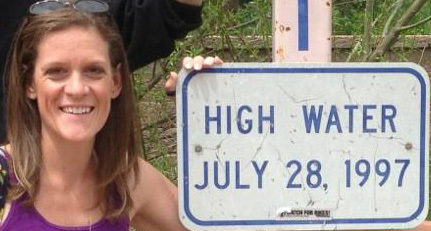 Happy Anniversary and Happy New Water Year! 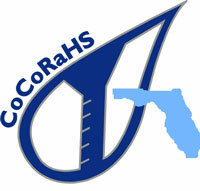 October 1st marks our 7th year of Florida CoCoRaHS! Some of you have been with us from the start and some of you are rather new to the program. Either way, thank you for continuing to be part of the program and counting every drop with me along the way. The data you've provided over the years has so much value, and I hope every one of you realizes the important part you play in data analysis and research. It's been a wonderful 7 years, and I look forward to many more. For those of you that have been with Florida CoCoRaHS over the last 5 years, be on the lookout in your email for your 5 Year Certificates! If you've logged in today, you should have noticed that the Message of the Day talks about the beginning of the 2014-2015 Water Year. Just a brief recap: the water year is the best consecutive 12-month period that spans the water storage and water usage part of the hydrologic cycle. While this is especially important out in the Western U.S. due to the water storage coming in the form of the winter snowpack, this cycle can be seen elsewhere across the country- just in a different form. 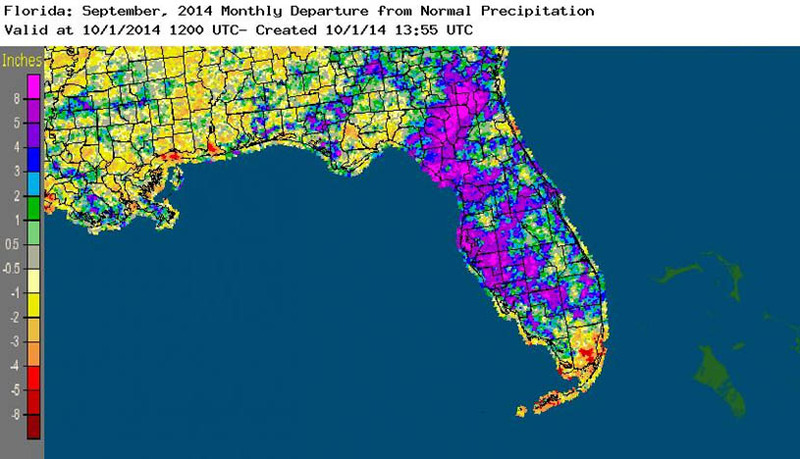 For us here in Florida, we are about to enter one of our typically drier periods across the state. 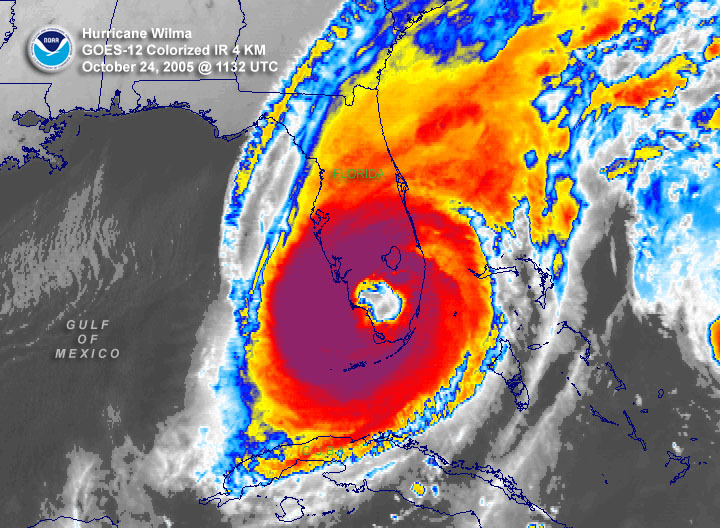 On October 1st, it will have been 3,264 days since Hurricane Wilma made landfall in Cape Romano, Florida on October 24, 2005 as a Category 3 hurricane. This was the last hurricane to impact the state, making this last 9 hurricane seasons the longest stretch of consecutive years without a Florida landfall. The longest period prior to this was the 5 years between 1980-1984. While weary Floridians have welcomed the break after the active 2004 (Charley, Frances, Jeanne and Ivan) and 2005 (Dennis, Katrina, and Wilma) seasons, the threat of hurricanes is real every year. Even though the 2014 Hurricane Season ends on November 30th, there is still plenty of time to prepare... because it's not a matter of 'if' but 'when' the next hurricane will make landfall in the state. Make sure you are prepared and stay tuned to the National Hurricane Center and your local National Weather Service office for official updates and information during the remainder of the 2014 Hurricane Season. 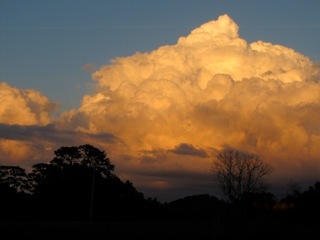 Beth (an Alachua County observer since 2012) shared these storm pictures from her home. I thought I would share one of my own pictures this month. 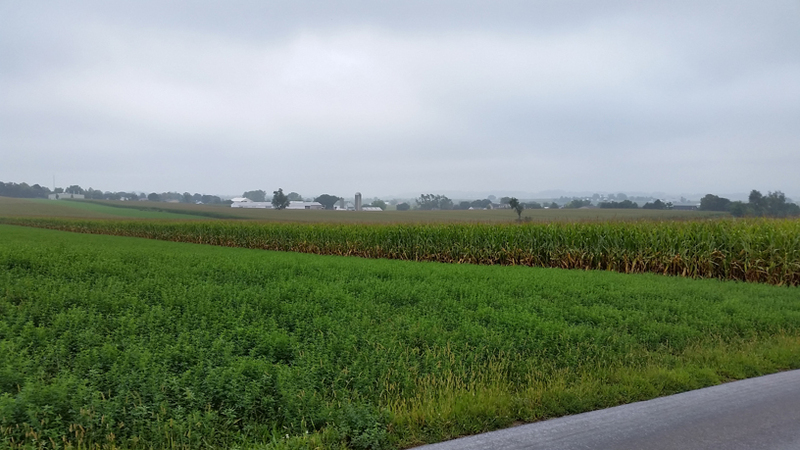 This picture was taken in Lancaster County, PA at the beginning of September. I took a quick trip up to the Mid-Atlantic (where I grew up) for a quick visit and played 'tourist' while I was in the area. I was hoping for to see some Fall colors, but the leaves weren't ready just yet. I would love to get pictures from other observers too! So as you're out and about over the next month, snap a couple of photos and send them my way. You may see them in our next newsletter. Portions of the Florida Peninsula reported monthly rainfall totals well above normal, while most of the rest of Florida saw below average rainfall during September. 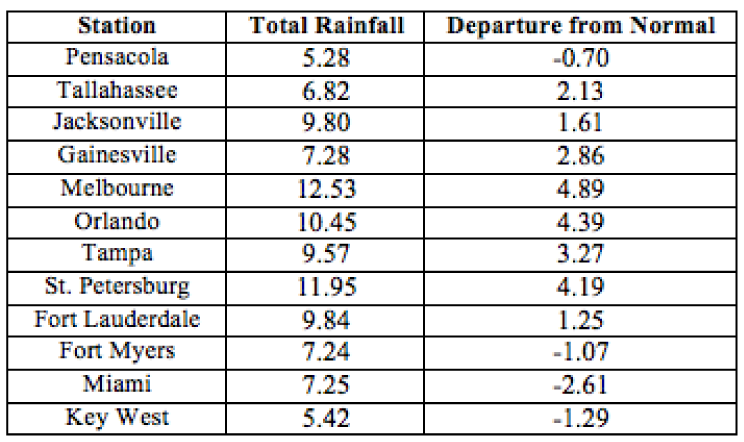 Departures from normal roughly ranged from -2.61" to 4.89" (Table 1), though localized parts of Florida saw rainfall totals that were as much as 5.00" below normal to over 8.00" above normal (Figure 1). 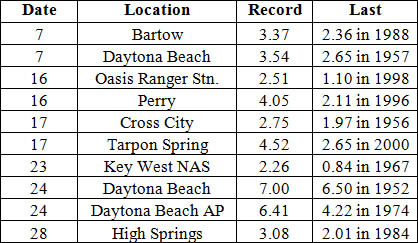 September 2014 was the wettest in Daytona Beach (18.51") in the 91 years records have been kept at the station. 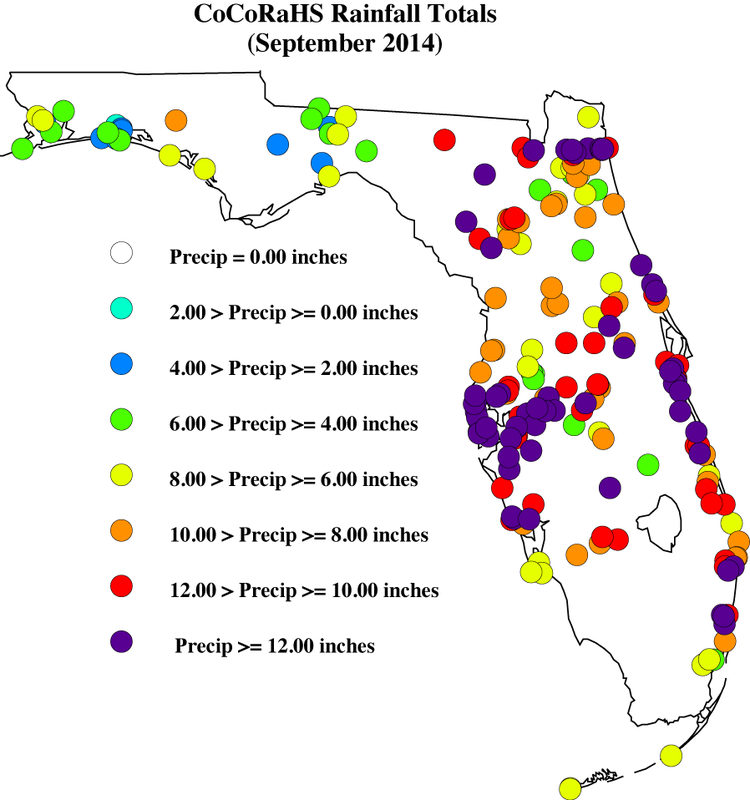 Miami, West Palm Beach and Vero Beach all reported 22 days in the month with measurable (>=0.01") rainfall; while Orlando had 20 days, Fort Myers had 19 days and Tampa recorded 16 days during September. There were multiple 24-hour precipitation records broken for the month (Table 2). Table 1. September precipitation totals and departures from normal (inches) for selected cities. 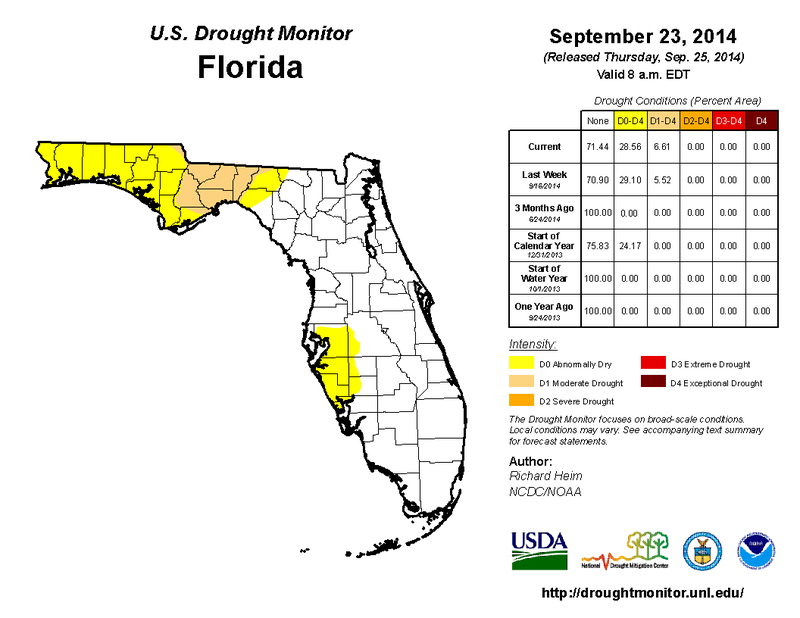 Due to the lack of rainfall through August, deteriorating conditions in portions of Gadsden, Jefferson, Leon and Wakulla counties prompted moderate (D1) drought conditions to be introduced, while the area of abnormally dry (D0) conditions in Panhandle and Big Bend grew to portions of the Suwannee River watershed. After the first week in September, that area of D0 was expanded to cover all of the counties in the western Panhandle, and D1 was mentioned in Madison and Taylor counties. The lack of summer rains along the west coast caused the D0 to be introduced into portions of Hillsborough, Manatee, Pinellas, and Sarasota counties and by mid-month this area of D0 was increased into western Desoto, Hardee and Polk counties. Some rainfall in North Florida eased the dry conditions in Baker, Columbia, Hamilton, and Nassau counties. By the end of the month, D1 conditions had been removed from eastern Big Bend counties (Madison and Taylor counties) but introduced in Franklin, Jackson and Liberty counties, and rainfall late in the month will prompt the removal of the dry conditions from the west coast and central Florida. Rainfall across the peninsula kept drought conditions in check during the month of September, and Lake Okeechobee reported a lake level above 15 ft., well within normal range.